Fun activities, attractions for kids and parents, and things to do in Edmonton, Calgary and cities and towns in Alberta. 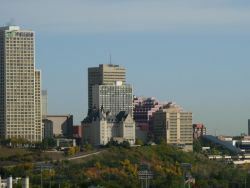 Edmonton, Alberta, Canada is the capital city of the province of Alberta. The Edmonton area is home to more than 1 million people. The region has grown a lot in the past 5 years. With a city this size there a lot of attractions, cultural facilities, festivals, events, recreation areas and parks that cater to all ages, so plan a trip with your children or use this site to have your children plan the trip with you. Edmonton has more parkland per capita than any other city in North America. Edmonton's North Saskatchewan River valley is the largest stretch of urban parkland in North America. The river valley is 22 times larger than New York City's Central Park. Edmonton has four distinct seasons. Summer can be sunny and warm, and winter, well we can’t hide it, we get snow! It can get cold sometimes, but that’s why we have indoor malls, indoor attractions, indoor pools etc. There are lots of great days in winter so activities can include downhill skiing and snowboarding, tobogganing, walking, skating etc. Spring and fall also have lots to offer. There are so many exciting things to do and see so plan to spend a couple of days in the Edmonton area. Alberta Events - Banff, Canmore, Drumheller, Fort Macleod, Lethbridge, Red Deer and Sylvan Lake, Alberta. Family events, travel ideas and itineraries. Alberta September 2017 events. Calgary Events - Calgary things to do and surrounding area, including Airdrie, Strathmore, Black Diamond, Bragg Creek, Chestermere, Cochrane, De Winton, Okotoks, Turner Valley kids activities. Fun things to do for the whole family. September 2017 Calgary Events. Edmonton Events - Edmonton activities and surrounding area, including St. Albert, Sherwood Park, Spruce Grove, Fort Saskatchewan, Devon and Leduc. Events for families and kids. Things to do. Summer, Fall, Winter & Spring activities and events in Edmonton and area. Updated very frequently. Edmonton September 2017 events. Things to do in Edmonton this weekend. Edmonton for little ones - Things to do in Edmonton with kids. Edmonton attractions for kids like the Valley Zoo or TELUS World of Science. Activities for toddlers, preschool, kindergarten, small children. Edmonton for tweens - Fort Edmonton, the legislature. Edmonton for teens - Edmonton things to do. West Edmonton Mall, Old Strathcona. Edmonton for students/youth - activities for youths. Kids Birthday Parties - ideas, activities and places for Edmonton, St. Albert, Sherwood Park, Spruce Grove, Devon, Bon Accord and Leduc birthday, teams and group parties. Edmonton Summer Camps - Summer Vacation, Winter break camps, Christmas break, Teacher's Convention, Spring Break, Easter Break in the City of Edmonton, St. Albert, Sherwood Park, Spruce Grove, Strathcona and Leduc. Little kids to teenagers. Calgary Summer Camps - Summer Vacation, Winter break camps, Christmas break, Teacher's Convention, Easter Break, Spring Break in Calgary. Little kids to teenagers. Alberta Summer Camps - Summer Day camps, Spring Break, Easter Break - Chestermere, Drumheller, Fort McMurray, Gull Lake, Kananaskis, Olds, Pigeon Lake, Red Deer, Rocky Mountain House, St. Paul, Sundre, Tofield. Family and Children - Articles about fire safety and escape, packing a nutritious lunch. Alberta Directory - Arts and culture, attractions, cities and towns, dance studios, education, health and wellness, movies, sports, webcams and skicams. Photo Album - Alberta Legislature, Banff, Calgary Zoo, Edmonton skyline, Fort Edmonton, TELUS World of Science, Ukrainian Village, Edmonton Valley Zoo, West Edmonton Mall. Resources - Online resources for students, online activities and games, social networking. Learn - Education & Online Learning Resources for students and teachers. K - University, mostly free.